The wait is over! 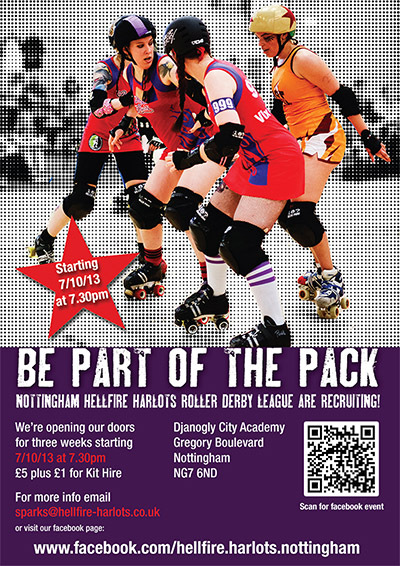 The Hellfire Harlots are recruiting for new skaters. We train from the ground up, so if you’ve never skated before no problem! We take all ages from 18 and above. We’re an all-female league but men are welcome as refs and NSO’s. Running as a 12 week block, our doors are open during Weeks 1 – 3 (7 October, 16 October & 23 October). After which point we’ll be closing doors again until January 2014, so don’t miss your opportunity to do something awesome. We provide kit so you can ‘try before you buy’. Lending skates, helmets, knee pads, elbow pads and wrist guards. Kit is lent on a first come first served basis so email May K Fist at sparks@hellfire-harlots.co.uk to book in advance. Sessions are £5 plus £1 for kit hire.